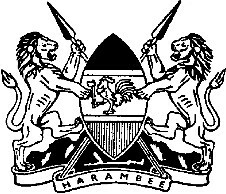 PURSUANT to Article 241 (3) (b) of the Constitution of Kenya, as read with sections 33 (1) and 34 (2) of the Kenya Defence Forces Act, 2012, notice is given that on 7th July, 2014, the Kenya Defence Forces deployed in support of the National Police Service in response to the Security emergency situation in Lamu County. Dated the 14th July, 2014. Cabinet Secretary, Ministry of Defence. To Download a scanned copy of the Kenya Gazette, click on the button at the bottom of the page.